Sunlight – Unfortunately a major cause of sofa damage is sunlight. As with any piece of fabric, if in direct sunlight for a prolonged period of time, you will see colour fade and the fibres will weaken. Wear abrasion – If your sofa material is a darker colour (shades of: blue, red, green, terracotta) it can lose its colour through, what is known as, wear abrasion. Put simply, it is the continual rubbing of clothing on the fabric during normal use. Perspiration – Bet you didn’t expect that one?! But it’s true! Perspiration builds up on the arms and often on the rear cushions where the head rests. … and believe it or not, hair oils and grease can cause severe damage over a relatively short time! Perspiration can affect the colour of the fabric and can even weaken the fibres. Trying to remove stains – Yes! 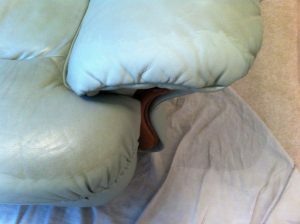 Unfortunately one of the biggest causes of sofa damage is ironically when people are trying to look after their sofa! If you try and remove a spill without the correct knowledge, then you can cause more damage. There is not one cleaning method to suit all types of fabrics. Some sofas can respond well to a damp cloth to remove a stain. Others sofas may end up with a nasty water mark if you try to remove the same spill. What can I do to maintain my sofa? Move/rotate your furniture every couple of months or so, to ensure that sunlight doesn’t always fall on the same areas. Have your upholstery cleaned regularly. Depending on use, we usually recommend that once a year is suitable for most households. This will help prevent perspiration damage. This will also help to prevent wear abrasion, as part of our upholstery cleaning process includes the grooming of your furniture; this is tailored to the specific material but aims to ensure the fibres are tangle-free and as fluffy as possible. Or is the case of leather, the grooming process involves applying hyde food to keep the leather soft and supple! If you spill something, don’t try to treat it until you’ve spoken to Careclean first! You can call us on 01245 323989 for free advice. Look at the difference on the front of this sofa arm after a clean by Careclean! If you own a sofa or armchair that’s become dull or stained over the years, and you’re looking for a reliable and trusted team of cleaners that provide professional sofa cleaning in Essex areas, get in touch with Careclean now for a free quote. Call us on 01245 323989 or visit our upholstery cleaning page for more information.